Hooded fur coat, made for women. The coat is made of natural merino lamb. On the outside the jacket is made of nappa leather and sheared lamb fur, the interior is lamb merino fur, trimmed to a thickness of 8 mm. This fur coat provides protection against moisture and cold, keeping a sleek and feminine look. The hood is a perfect accessory for cold days, maintaining the heat and providing a fairytale look. The coat closes with a cord made of lamb nappa leather and doubled assorted chest buttons. 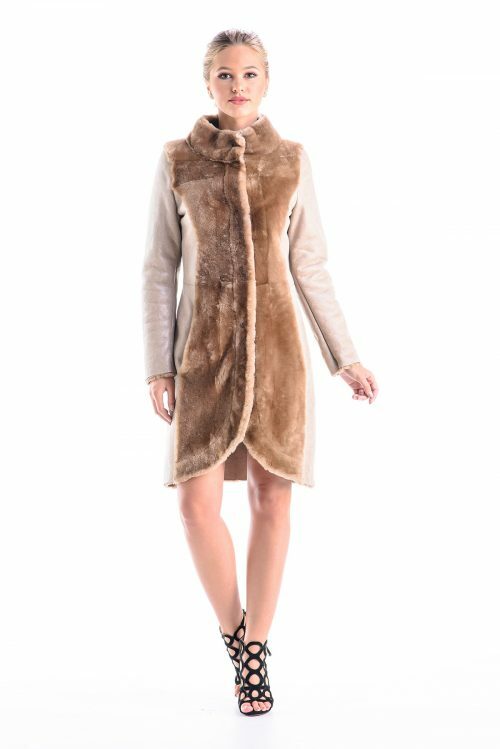 The base of the sleeves on this fur coat are made of lamb fur, trimmed.This hooded coat is available in one color: light brown, easy to match with your daily outfit.